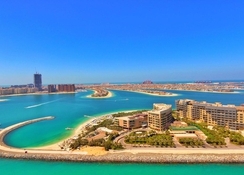 A relaxing beach holiday with your partner or family in Dubai gets all the more luxurious and memorable with a stay at the modern and luxurious Rixos The Palm Dubai that offers a private beach where you can soak up the rays. Sitting at the tip of the Palm Jumeirah’s crescent, this splendid hotel offers a 360-degree view of Dubai that encompasses the crystal-clear waters of the Arabian Gulf, Burj Khalifa and Burj Al Arab dominating the glittering skyline of the Dubai Marina and the Palm Jumeirah itself. The hotel is the only property in Dubai that offers luxury multi-concept resort and provides ultra-all-inclusive, bed and breakfast or half board packages. 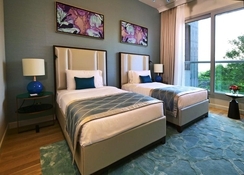 Its 230 beautifully decorated, spacious rooms and suites boast spectacular views of the Dubai marina and iconic landmarks, while the on-site restaurants and bars serve a selection of culinary delights and over 70 brands of drinks. Enjoy a meal at one of the hotel’s restaurants or chill out at the Shisha Lounge, among the many bars. You can also check into the spa and try out the therapies on offer, or if you’re feeling sporty, go fishing, kayaking, skydiving or join a Pilates class on site, if you like. 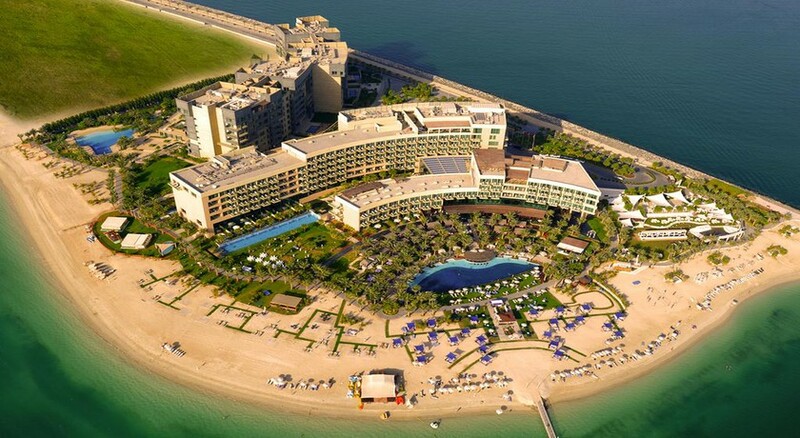 Rixos The Palm Dubai this Dubai sits right on the beach and is in proximity to Dubai’s shopping centres and sightseeing attractions. It is within 10km of Aquaventure, and the Dubai Marina and Montgomerie Golf Club are within 20km. Shopaholics will be delighted to find Mall of the Emirates only 17km and the Dubai Mall/Burj Khalifa 30km from the property. The Dubai International Airport is 47km away. 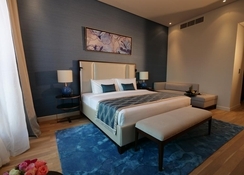 Decorated in cream and gold hues with wooden furniture and flooring, the 231 soundproofed guest rooms and suites at Rixos The Palm Dubai offer spectacular views of the Arabian Gulf and the city’s skyline, that includes landmarks such as Burj Khalifa and Burj Al Arab. Guests can enjoy deep soaking tubs, and choose from eight categories of rooms, including Deluxe Rooms (island view), Premium Rooms (island and sea views), Wellness Rooms (island and sea views), Junior Suites (island view), Senior Suites (island and sea views), Sea Grand Suites (island and sea views), King Suites (island and sea views) and Grand King Suites (island and sea views). Rixos The Palm Dubai houses three restaurants and six bars. The A La Turca is the main restaurant offering buffet meals and a live cooking station, while the Aegean Restaurant prepares contemporary Mediterranean and oriental seafood. If you’re looking for a romantic meal for two, check in at L’Olivo Ristorante that serves Italian and Mediterranean-inspired cuisine. The bars include Eden Beach Club, Biber Lounge, Highlights Bar, I-Chill Beach Lounge, Nargile – Shisha Lounge and Patisserie Istanbul (the 24/7 coffee shop). The hotel has enough to keep guests entertained, with a private beach, outdoor tennis courts and a health club, besides two outdoor swimming pools and a children’s pool. There’s also a Rixy Kid’s Club, a fitness centre and separate ladies-only gym. Water lovers can enjoy tons of water sports on the expansive beach. Water sport activities include kayaking, windsurfing, fly fishing, knee boarding and snorkelling. You can also go golfing nearby. The Rixos Royal Spa, equipped with a sauna, spa tub and Turkish bath/hammam, has 11 treatment rooms with rooms for couples and outdoor treatment areas, offering massages, facials, body scrubs and treatments. You can also play beach volleyball, water polo, step aerobics, tennis, badminton, basketball and table tennis. The hotel organises entertainment activities that change on a seasonal basis and are perfect for families, friends and couples.